This photocopy of the title page of the original 1830 edition of the Book of Mormon gives modern readers an idea of how the book first appeared when it was published in Palmyra, New York. 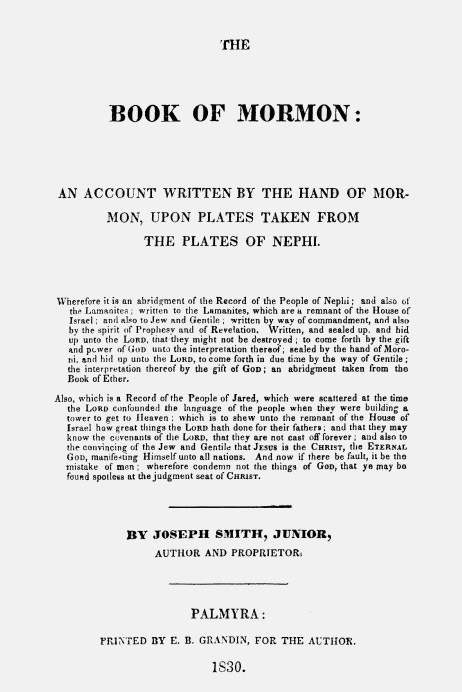 The first title page differs from the title page of the current (1981) edition, the most obvious difference being that Joseph Smith is listed as the "author and proprietor" of the Book of Mormon. As the copyright page explains (see chart 167), he named himself the "author and proprietor" consistent with federal law only to secure a copyright for the Book of Mormon, thus making illegal any alteration of text by those who do not hold the copyright.